The month of May is a busy birthday month for us. Amongst other birthdays, our middle daughter Esme was turning three on the 3rd and our eldest daughter Freya was turning seven on the 9th. Around the time of Esme’s birthday we had noticed that her complexion was paler than usual and her legs were quite bruised. Her behaviour had changed somewhat too – she was very aggressive all of a sudden and there was no reasoning with her. Apart from that she was well, no cold, no temperature and we just put it down to being three years old, starting pre-school and being more tired than usual. Several days after her third birthday she complained of severe leg pains that made her cry and she wanted to sit in the pram more frequently, which was uncharacteristic. A few days later she started to fall asleep in the middle of the afternoon and kept complaining she was cold. I had also noticed little red ‘pin prick’ spots on her body. There were still no cold symptoms or temperature. So on the afternoon of the 11th May I trundled off to the GP, with Esme’s two sisters in tow, expecting to hear that it was viral. Our GP was amazing and did a full assessment of Esme. She wrote us a referral letter and sent us straight to A&E to have some blood tests. That very evening we were in our local hospital having tests, scans and being asked questions. In the early hours of the morning on 12 May the Registrar confirmed that Esme had a form of leukaemia and that a bone marrow aspirate was needed to determine which type. He explained that it was treatable. But he totally floored us when he explained treatment would take several years. We had no idea and knew that we would have to learn a whole new vocabulary to understand what was happening to our dear Esme. On the evening of 13 May 2012, we were blue lighted down to The Royal Marsden to have the bone marrow aspirate and begin intensive treatment. 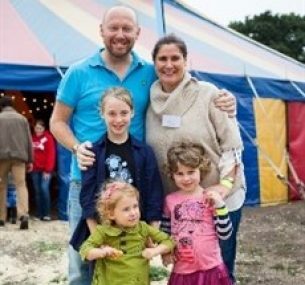 Strangely it wasn’t until we arrived at the Marsden that reality hit me – Esme was desperately sick and our family life was about to be turned upside down. 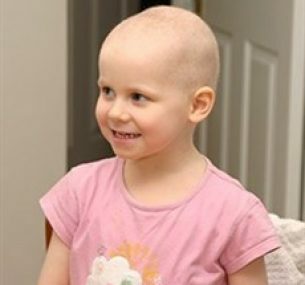 On 16 May 2012 Esme was diagnosed with acute lymphoblastic leukaemia and treatment was well underway. The big milestones hit us. The loss of hair was heart breaking, more for us than her. Vacuuming it off her pillow and sheets in the mornings really brought it home to us. 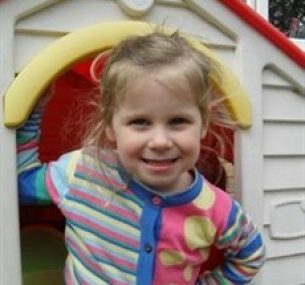 Esme was so unwell that she couldn’t attend pre-school or take part in the Christmas Nativity play – the normal things that every child should have the right to. Explaining to our eldest daughter, Freya, that her sister was very sick, and that sadly a spoonful of paracetamol wouldn’t make her better and that Freya would be nine years old before her treatment finished, was very difficult. Juggling work and raising three children (when Esme falls sick and is hospitalised I go with her and it falls to Dad to juggle his job and our two other daughters whilst trying to keep life as normal as possible). Esme is now four years old and is very matter-of-fact about her treatment. She understands that she has poorly blood and needs to have constant medication, blood tests and hospital visits. She talks of ‘magic sleeps’, ‘wigglies’ and transfusions like they are normal occurrences. Some days we forget she even has leukaemia and other days it is like a blow to the head that she is still so very poorly. She still becomes unwell and needs hospitalisation yet in September 2013 she was able to start part-time Reception class at school. As a family we try and keep life as normal as possible for our three daughters – there are lots of treats to just try and make things better for them as best we can. We still tackle one day at a time and sometimes it is one hour at a time. But together we make a good team and the overwhelming kind support from family and friends and charitable organisations enables us all to tackle this dreadful childhood illness. Esme is doing well. She finished her treatment in August of this year and is now having check-ups every six weeks. She is enjoying school and has a lovely set of friends. Her temperament has quietened down somewhat since finishing all the chemo and steroids and she no longer gets irrationally angry. She still has her fiery spark but it is a lot more manageable – thank goodness! Since finishing treatment all our girls have been treated to a pet chicken each so Esme and her sisters love to see if they have laid each morning! The novelty hasn’t worn off yet, so we are very pleased. Esme will be eight this year and is growing up beautifully. She is kind, caring, smart and getting stronger all the time. She has recently started gymnastics, enjoys Parkrun and is starting to try her hand at netball. She remembers her time on treatment but remembers all the lovely nurses and medical staff, parties in the play room and the play specialists! We still take each day as it comes and alarm bells sometimes ring if Esme shows signs of being unwell – but we have the security of regular check ups. 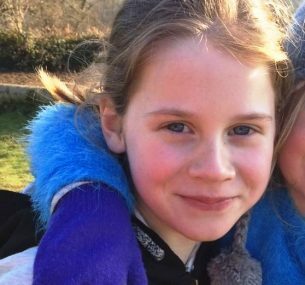 We are very proud of Esme and her sisters and amazed at how they have all coped magnificently when faced with the unimaginable five years ago. 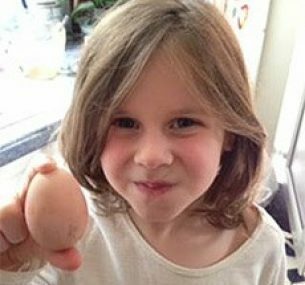 Esme and her sister Honor help explain Dr Karin Straathof’s research. Esme is a childhood cancer survivor. Dr Straathoff is researching a totally new way to treat neuroblastoma – a childhood cancer that can’t be cured with current treatments.